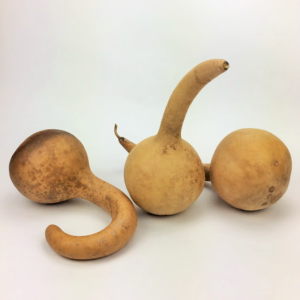 These long neck dipper gourds have a lengthy handle and large ball. Great for birdhouses, painting and other crafts. All gourds come dried and cleaned. Big ball short handle dipper gourds are perfect for all kinds of crafts such as birdhouses, woodburning, painting, and rattles. They have bulbs between 4″ –5″ in diameter and handles that range from 6″ – 8″ in length. The total length is usually between 12″-14″. Handle may be straight or curved. Big ball short handle dipper gourds are perfect for all kinds of crafts such as birdhouses, woodburning, painting, and rattles. They have bulbs between 5″ –6″ in diameter and handles that range from 6″ – 8″ in length. The total length is usually between 12″-14″. Handle may be straight or curved. Very versatile gourd, long handled dipper gourds have a ball diameter ranging from 5″ – 6″ in diameter. Large in overall size. Display with flowers, candles, incorporate into a beautiful centerpiece or just use alone. See the lovely centerpiece below, cut out and insert a jar, add water, and display fresh flowers. These gourds also make a nice birdhouse too! Our box of 8 long handled dipper gourds have a ball diameter ranging from 5″ – 6″. Large in overall size and length – popular to display with flowers, candles, and centerpieces. These gourds also make great birdhouses! Very versatile gourd, long handled dipper gourds have a ball diameter ranging from 5″ – 6″ in diameter. Large in overall size. Display with flowers, candles, incorporate into a beautiful centerpiece or just use alone. See the lovely centerpiece below, cut out and insert a jar, add water, and display fresh flowers. These gourds also make a nice birdhouse too! These dippers have some small surface irregularities and/or blemishes. This box of 6 medium dippers have ball diameter around 4″ – 5″ in diameter. These gourds are perfect for showing flowers, candles, and other crafts. They are also great for birdhouses. This box of 6 medium dippers have ball diameter around 4″ – 5″ in diameter. 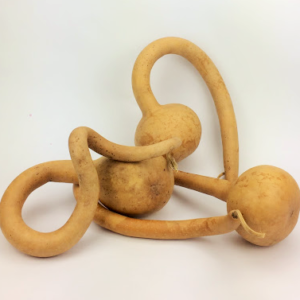 These gourds are perfect for showing flowers, candles, and other crafts. They are also great for birdhouses. These dippers have some small surface irregularities and/or blemishes. Very versatile gourd, long handled dipper gourds have a ball diameter ranging from 4″ – 5″ in diameter. Large in overall size. Display with flowers, candles, incorporate into a beautiful centerpiece or just use alone. See the lovely centerpiece below, cut out and insert a jar, add water, and display fresh flowers. These gourds also make a nice birdhouse too! Very versatile gourd, long handled dipper gourds have a ball diameter ranging from 4″ – 5″ in diameter. Large in overall size. Display with flowers, candles, incorporate into a beautiful centerpiece or just use alone. See the lovely centerpiece below, cut out and insert a jar, add water, and display fresh flowers. These gourds also make a nice birdhouse too! These dippers have some small surface irregularities and/or blemishes. 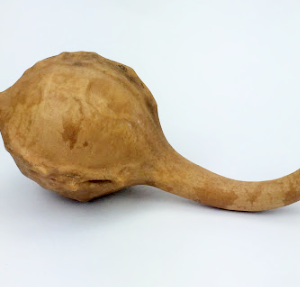 Rattle shaped gourd. Great for many different crafts. Short dippers have bulbs that range from 4″ – 5″ in diameter and handles that range from 6″ – 8″ in length. The total length is usually between 12″-14″. Handle may be straight or curved. If you need a particular shape or size, please make note of this at the end of check out in the notes section. 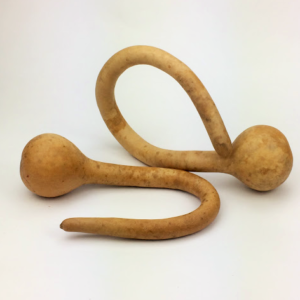 Rattle shaped gourd. Great for many different crafts. Short dippers have bulbs that range from 5″- 6″ in diameter and handles that range from 6″ – 8″ in length. The total length is usually between 12″-14″. Handle may be straight or curved. If you need a particular shape or size, please make note of this at the end of check out in the notes section. Maranka’s are known for their protruding veins. They are commonly used for rattles and crafts. Make nice bird houses, dippers and planters too. Ball is 5-6″ in diameter and total length is about 12″. Ball Size 3″ – 4″, length is 11″ – 14″ long. Nice hard, smooth shell. This is a box of 6 of our small dippers. The have a ball size of 3″ – 4″ in diameter and length of 11″ – 14″. This is a box of 6 of our small dippers. The have a ball size of 3″ – 4″ in diameter and length of 11″ – 14″. These dippers have some small surface irregularities and/or blemishes. Ball Size 3″ – 4″, length is 11″ – 14″ long. Nice hard, smooth shell. These dippers have some small surface irregularities and/or blemishes.